Stay on the right side of tasteful style with this rectangular oversized gray wall mirror. 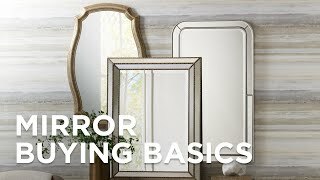 Bringing classic sophistication and a gorgeous look to any transitional space, this elegant creation from Uttermost offers the best of what mirrors mean to decor. With a conventional frame crafted partly from iron, its rugged composition is softened with a sleek taupe gray wash finish and touched up with lightly antiqued silver leaf inner and outer frames. This transitional rectangular oversized gray wall mirror looks delectable whether mounted horizontally or vertically. 40" wide x 52" high x 2 1/4" deep. Hang weight is 44 lbs. Glass only section is 23 3/4" wide x 35 3/4" high. Surrounding frame is 8 3/4" wide. Beveled edge is 1 1/4" wide. Rectangular oversized wall mirror from the Uttermost Draven Mirror collection. Taupe gray wash finish with lightly antiqued silver leaf inner and outer frames. Iron and MDF wood frame construction. A sun shaped trim made of a silver leaf bracket style frame borders this oval wall mirror. Howard Elliott Queen Ann Silver 24" x 36"
Celebrate classic romanticism with the modern streamlined details from this rectangular wall mirror. Brighten up any space in your home with this Uttermost sunburst design with a convex mirror at the center.